HE started his career on the engineering side of the mining industry, played rugby in England for three years from 2009, and is now the proud recipient of this year's Dormehl Phalane Property Group 'Rookie of the Year' award - for sterling efforts during his first year with the fast-growing property company. 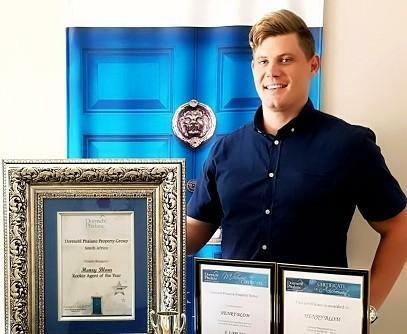 He is 29-year-old Henry Blom, a gym fanatic, rugby wing and bachelor intern agent at DPPG's Rustenburg branch, where he has been based since the branch opened there, in Beyers Naude Drive, on March 1, 2018. The branch has eight agents and is under the wing of Owen Dormehl, who heads DPPG with partner Tau "Daniel" Phalene. The Rookie of the Year award, presented to Henry at the DDP awards ceremony at The Estuary in Port Edward on March 6, was in lieu of his having achieved the highest commission in the group during his first year with the company. "I was in the lucky position to have sold a commercial listing in excess of R2million," he says, pointing out he is involved in residential, commercial and agricultural sales. How did he feel about going up to collect his prize at the award breakfast? "I was nervous, yet very excited as this indicates a new beginning for me in a company that is destined to reach unbelievable heights. It was an honour to receive recognition for the hard work I put in during the year. This has also motivated me to be better going forward," he explains. Henry received not only a framed certificate, floating trophy and gift laptop as the Rookie of the Year, but also was placed third in the category of National Registered Sales Agent of the Month: Urban. "It was excellent!" Henry says of the awards ceremony and pool-side party. "Owen really goes out of his way to reward hard workers," says Henry, pointing out that he was excited to join the property group which "has an excellent reputation and where Owen's legacy precedes him in the industry". Henry could be on the awards platform a lot more in years to come, judging by his track record in more recent times. He proudly announces that he has closed a deal on a R65million farm, about which he is very excited. "Selling the R65million farm has opened new doors for me. I learnt valuable lessons and am confident that I can sell another one this year." Klerksdorp-born Henry, who turns 30 on April 18, attended President Primary School and HTS High School. An avid rugby fan, he currently plays for Vaal Reefs. In the three years he was in England pursuing his rugby career he played for Ipswich, Bury St Edmunds and Canterbury University. "I also played for Bedford Athletic on a national level. When I returned to South Africa I also played for the Pumas. I still play rugby in my spare time and am currently playing in the position of wing for Vaal Reefs." Between property and rugby, Henry is also enrolled in a Business Entrepreneur and New Technology course with AIE School of Business. "I was attracted to the property market when I met my fiancé, Jeané, who is a second-year LLB student. I decided to create a future for myself in the industry as I get the opportunity to build my own business inside the Dormehl Phalane franchise.," he says. "The support from our office, as well as head office, makes this a step in the right direction and I definitely have a bright future ahead of me. Owen is a real leader and mentor and he has been an inspiration." Henry's views on why he chose to be part of the DPPG family? "The fact that we embrace transformation and offer our clients a high service level are our biggest strengths. The affiliation we have with Property Fox is also one that is going to push Dormehl Phalane to unknown heights within the industry." The DPPG branch in Rustenburg may not be big, Henry says, but agents there are not only a team, but work as a family: "We are still small and this affords us the opportunity to grow into the company, and to place our own stamp on the brand. "We follow a set of principles and business ethics that govern our decision-making processes, and of which we are consciously aware on a daily basis. We also have an in-house bond originator which assists in getting buyers pre-qualified and bonds approved in record time. "Our combined property experience in the franchise alone is in excess of 28 years and this shows in our service level offered to our clients. "I am still young and think I have brought in a new era of youth in the industry. Estate agents are usually seen as older people and our team is made up of young entrepreneurs who want to make a difference in the market place". Henry is optimistic about the future of the property business. "A lot of agents see a grim future for the property market, and as a result of this I believe only strong, motivated and driven agents will survive. "Rustenburg is a growing city and although it has been hit with hardships, one can definitely see the property market picking up. Agents with the right attitude and perseverance will be agents working in property 10 years from now. "The fact that I am still young and determined to make this my career, ensures that my future within DPPG is set in stone. I want to make this a success and am willing to work hard. "Determination and the will to survive in this industry is what determines where and how far you can go. Nothing is impossible! Our office motto is: 'We don't list properties... we sell them!'"